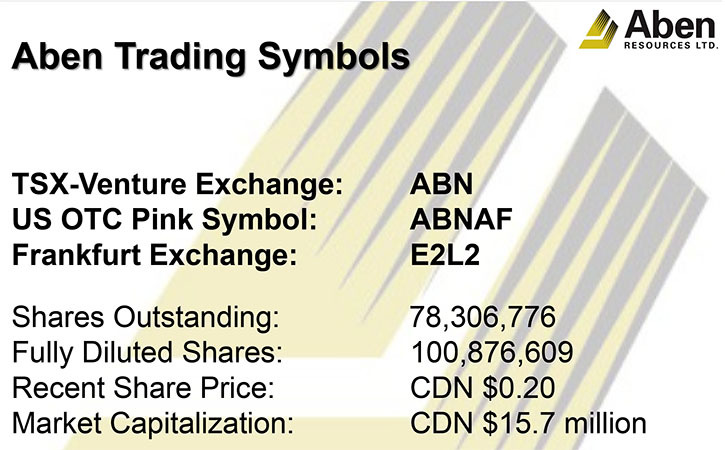 Aben Resources Ltd. (TSX-V: ABN, OTC PINK: ABNAF, Frankfurt: E2L2) is a Canadian gold exploration company developing three great projects in British Columbia’s Golden Triangle, the Yukon, and Saskatchewan. 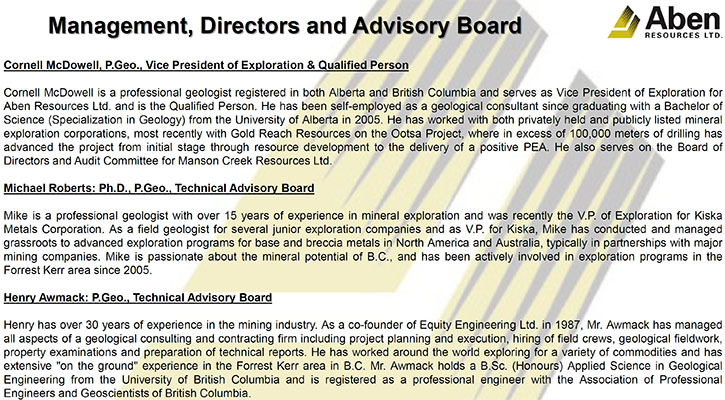 We learned from Jim Pettit, President and CEO of Aben Resources, that their flagship project is called Forrest Kerr Gold Project in the Golden Triangle, northwestern British Columbia, which is a very well-known area for high-grade deposits. 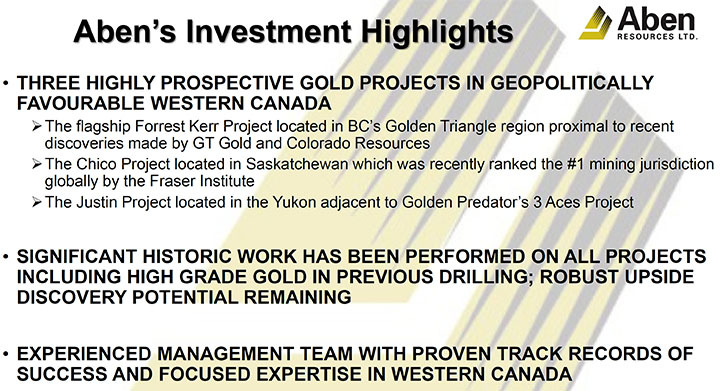 As well as the Forrest Kerr project, their project in Saskatchewan can be drilled in the winter and is located near the old Claude Resources' gold mine bought by Silver Standard, and their Yukon property is tied right into Golden Predator. We learned from Mr. Pettit that all their properties came with a lot of historic data. This allowed them to compile very clear exploration models for each Property. Plans for 2018 include following up on the exciting high-grade discovery they made last year at Forrest Kerr Gold Project with more drilling, as well as testing new geochemical exploration targets. According to Mr. Pettit, they have a great management team, with about 100 years of knowledge and good access to financing. Dr. Allen Alper:	This is Dr. Allen Alper, Editor-in-Chief of Metals News, interviewing Jim Pettit, President and CEO of Aben Resources, LTD. Could you give our readers and investors an overview of your company? James Pettit:	Sure, absolutely. 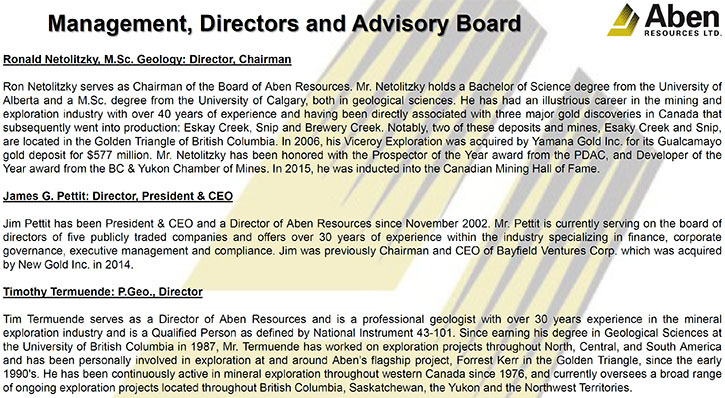 Aben Resources is a gold exploration company in Canada. All three of our properties are located in western Canada in very good political jurisdictions. 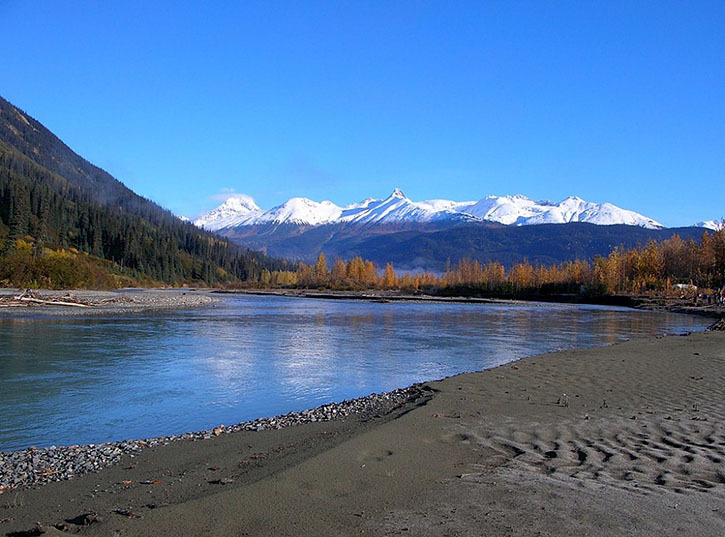 Our flagship property is in the Golden Triangle, northwestern British Columbia, which has been a very prolific area for high-grade deposits in the past. There's two new deposits that recently were brought into production, Pretium and Red Chris, Imperial Metals' copper deposit. We have a project in Saskatchewan which allows us to drill in the winter. 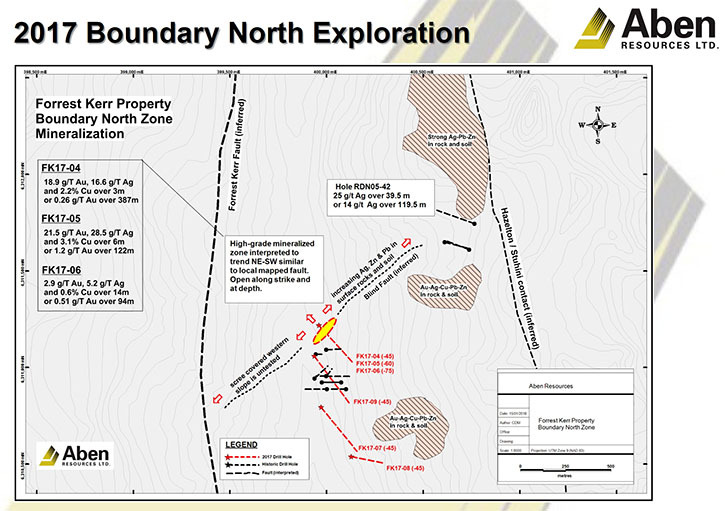 It's just south of the old Claude Resources' gold mine, which has been bought by Silver Standard. And then in the Yukon, we've got a great property up there. It's tied right on to Golden Predator. We think we've found an extension of the 3 Aces, but that's to be proven this year. Dr. Allen Alper:	That sounds excellent. It's great to have three gold properties in three great jurisdictions and a good company with other big deposits in mining companies. James Pettit:	They're all in good areas, and we're basically in the vicinity of some pretty significant majors as well that are currently operating. So it gives us a lot of confidence. All the properties, as well, have a lot of historic data available to us that we've done compilation studies with. It's given us a good look at the geology of the region. What we like to do is go in and take a larger position, for example, the Forrest Kerr in the Golden Triangle. We optioned a 100 percent interest in three historic properties from three different groups. They're all attached to each other and they're all lined up along a major structural feature in that region which is called the Kerr Fault. The Kerr Fault is a major structural feature that's very important to the whole region in terms of it acting like a geological engine. Dr. Allen Alper:	Sounds excellent. Could you say a little bit more about the three properties? What differentiates them, what makes them interesting and anything about the data you have obtained up to now. James Pettit:	Sure. 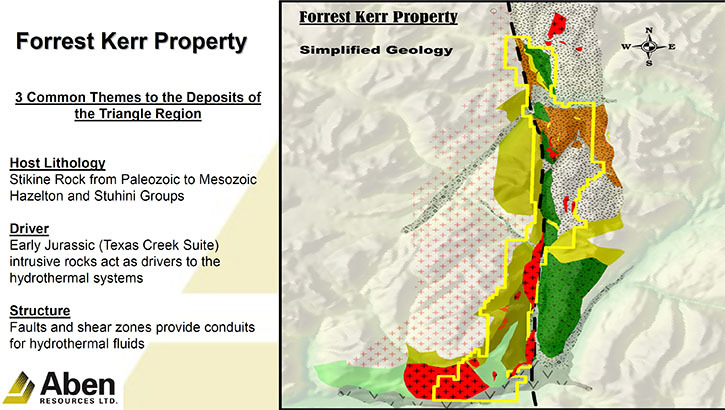 For example, in the Golden triangle, the Forest Kerr project came with a tremendous amount of information. It took us about six, almost eight months actually to do the data compilation. It came with 130 historic drill holes, 20,000 soil samples, over 2,000 rock samples, and a varying degree of geophysics that was offered back in the day. And I'm going back 30 years for a lot of this information, so we have to bring that up to date. Instead of just property by property geology study, we made it a regional study. And that gave us a much better outlook, and all that was combined with the BC government's geological surveys new geologic discovery model. Their personnel have come up with a model up there-an exploration model-as that region is extremely complex. There's been-over the hundreds of millions of years-a lot of volcanism, which basically allows for these very high grade deposits that have historically been found there, like Snip and Eskay Creek. When Eskay was found it was the highest grade mine in the world. And today's Pretium is probably going to be there as well. So it allows us to approach it from a new angle. The new model by the Geologic Survey is actually very telling. You need to be within two kilometers of the geologic contact between the Hazelton and Stuhini host lithologies. But couple that with a major structural feature, like a fault, that allows for the emplacement of fluids and increases your discovery potential tremendously. And we're there. Almost the whole length of our property has both these features within two kilometers of each other. And so what we find is an incredibly target-rich environment. Our whole discovery process is led by geochemistry, so we're doing a lot more work surface sampling and following the chemistry. So far it's worked. Last year, on our fourth, fifth and sixth hole, we hit a major find. We're calling it a discovery, but it is three holes that hit starting at 16 meters deep, based on a surface geo chem anomaly, where we were getting 30 to 50 grams per ton on surface. And this is an extremely broad discovery. All three holes, one was over 300 meters wide-down to 100 meters wide, well-mineralized but with high grade cores, like high grade up to 20 grams up to six meters, that sort of thing. So we're looking at that success and we're going to expand on it. We'll double our drilling this year and if we're successful out of the shoot, which I strongly hope we will be. I'm pretty encouraged that we can start the season with good success and good turnaround times in the labs for our assays that we may even be able to finance more and increase the size of our program for this year. Dr. Allen Alper:	That sounds fantastic. James Pettit:	The other properties are very similar. The Saskatchewan project has had a lot of work historically done, going all the way back. Go back 25 years, Calpine-those types of companies that were big explorers back in the day-they were all in that area. So we've got all their information. The Yukon, there's not as much information, but there was information there and we drilled back in 2011, 2012 when the Yukon was a hot area to be. We did discover an intrusion-related gold system, so we think we're on to something up there. We'll be working up there come August, which is a good time because the Golden Triangle will start August, September, October start winding down anyway. It makes for a good year. Dr. Allen Alper:	That sounds excellent then. 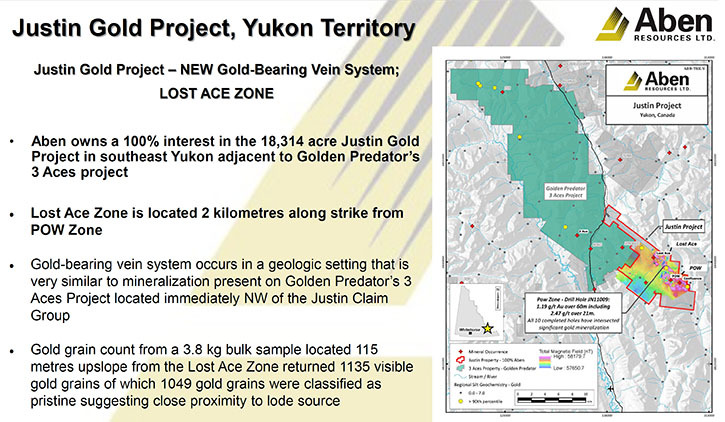 And in the Yukon, you're right next to Golden Predator, is that correct? James Pettit:	Yeah, last year we did a little trenching program up there. We used a government grant that Yukon offered. So we spent 150,000 dollars trenching, soil sampling. We thought we'd encounter something interesting so we sent in a 40 kilo bulk sample to a lab for gold grain analysis, and ethane. And out of the 40 kilos, we ended up with about 1,300 gold grains. And over 1,100 of them were pristine. They were very jagged. So when we took a good hard look at the area we were in and we took one of the lead guys from Golden Predator up there, who's now going to work for us this year, he basically said that we're probably within 20 meters of the vein system. It could be the same vein system as 3 Aces started with. Dr. Allen Alper:	That sounds exciting. It sounds like you have a very ambitious exploration program going on and will have a lot of results in 2018. James Pettit:	It's going to be a very active year. I didn't talk about management or anything, but we've got a good management team. We've got probably just about 100 years of knowledge of the golden triangle area with Ron Netolizky, our chairman. He's one of the discoverers of Snip and Eskay Creek 30 some-odd years ago. And we've got a couple of guys that came with the properties from our acquisitions. They had these properties for over 20 years and their extensive knowledge base in the area is invaluable. And we've got, between us all, quite an extensive background in the discovery process. James Pettit:	Sure. I've been in the business a long time. Not on the geologic side, but mainly on the corporate governance, management and finance, 20 years now anyway. The last company that I actually ran was Bayfield Ventures, and I sold it to New Gold back in the end of 2014. Good timing, the market went very soft and so I just looked around for things to do and this caught my attention. And one of the other directors and I were the ones that assembled this whole property package for Aben and said "Let's put together a solid gold company with good people, good projects, and access to financing." And we do have that, we've got good access to financing. Dr. Allen Alper:	That sounds very good. Could you tell our readers about some of your geological members of your team? James Pettit:	Absolutely. Like I was saying, Ron Netolizky, his pedigree is amazing. He discovered Snip, he discovered Eskay Creek. Him and Tim Termuende, who's also on the board, spun out Copper Canyon, sold it to NovaGold. There is a few others that Ron was involved with up there but he was also involved with Viceroy down in California in that discovery process. There was another one, I'm just trying to remember the name of it, in Ontario. But he is a serial M&A guy. He's really something. And he's one of the best geologists around. Tim Termuende started his whole career with Ron and the Golden Triangle. He's in his 50's, whereas Ron's probably in his 70's now. And then there is Henry Ohmack and Mike Roberts both have extensive background up there with their respective properties that we now have in our company. And they're on our advisory board. And they're a wealth of knowledge up there. Then Cornel McDonald, he runs our program for us. He and I worked together on another project just south of the Golden Triangle, a copper project. Developed a resource, it's next to the Huckleberry Mine actually. He oversaw over 130,000 meters of drilling for me. Dr. Allen Alper:	That sounds fantastic. Excellent group, excellent background. Really fantastic track record, so that's great. Could you tell me a little bit about your share structure? James Pettit:	Sure. There is currently 78,000,000 shares outstanding. Fully diluted, it's just over 100 million. The difference there, that 22,000 is probably the last two sets of warrants from the last two financings. They've got time still on them. This summer maybe if the stock does what it did last summer a lot of that will come down. And then that helps with the financing. Last year we took down about a million and a half dollars’ worth of warrants. And then there's a balance left, about 5 million is options that the management and staff have. Dr. Allen Alper:	That sounds very good. James Pettit:	And I might say large shareholders-just really quick. We've got a big fund out of Europe that holds 9.9 percent at any given time. And if they don't necessarily always get it in financings they go into the market, support the market, that sort of thing. Then we've got management. Management holds management and insiders and we have a very good control position group I call it that hold about 20 percent as well. Dr. Allen Alper:	That's excellent. It shows a share of skin in the game, that's great. Could you tell our readers and high network investors why they should consider investing in Aben Resources? James Pettit:	I think from a discovery upside potential this is a good company that demonstrates it's got the right ingredients. It's go the property, the people, and the access to financing. We are an exploration play. It's not like we're developing a deposit. I've just been at a couple of shows, mining conferences, mineral exploration conferences, and to be honest, right now in this market it's kind of soft but the explorationists are getting the attention, whereas the development stage companies that have a resource and are trying to make it bigger, they're not getting fully valued right now. And that will change, but it will probably take a couple of years to see that change really happen. In the meantime, you're going to have companies like this one that is in an area where you have area plays happening. You've got all kinds of companies around us and we actually respond to other companies' news. It's one of the nice things and the fun things about these area plays. 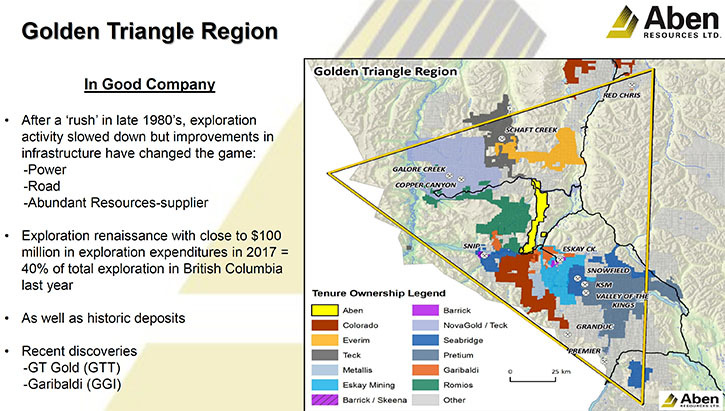 There will probably be 100 to 150,000,000 dollars spent on exploration in the Golden Triangle in BC this year. I think that's really, in a market that's kind of soft, that's where you want to be. Where you can have that potential for discovery upside. Dr. Allen Alper:	That's excellent. Is there anything else you'd like to add, Jim? James Pettit:	I think gold took a bit of a hit recently, but the venture markets in general took a bit of a hit because of a couple of things. The cannabis stocks got hit hard and the block chain and the crypto stocks got hit hard. And that pulled it down. Gold was facing competition for the first time in an area that no one had ever seen before. I think because those stocks are now falling down to reality, I think you've got a potential for gold to actually lift. Dr. Allen Alper:	That sounds very promising.